Two rounds in and we're raring to go with round three at Mugdock Country Park, near Milngavie. 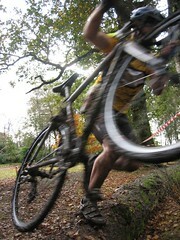 A perennial favourite on the calendar, Glasgow Mountain Bike Club's event is not to be missed. The course is a corker with plenty to keep you amused. No dives from the bridge this year please - it's not a triathlon! The proximity of the visitor centre and cafe make this event it a firm favourite with spectators too. Racing starts at 11:00 with the Youths race, followed by the Seniors/Womens/Vets/Juniors Race at 12:00 and U12s races at 13:15 (or there about). Entry is available on the day and is a bargain at £4 for Youths, £8 for the main race and free for U12s. For race location see the Where and When link up there on the right - note that the location on the Scottish Cycling calendar is currently incorrect. The SCX shop will be in attendance with a range of t-shirt and caps to keep you looking fine. Keep your eye on the shop page for a full list of what we'll be bringing with us to events.